As you know if you have been following my blog (all four of you), I have been working on my pastry technique. Every time I think I have got it down, I'll roll out something soggy, or tough, or salty. Yes, salty, and don't ask. Because I don't want to be drowning in pie (although now that I have written out those words that doesn't seem like such a bad thing), I have tried to intersperse some savory between the sweet. I've made quiches, tarts, and a chicken pot pie, all with varying degrees of success. Some were a little runny. Some were too thick. The mustard greens quiche was a touch too bitter. The onions on the potato and caramelized onion pie were a wee bit too caramelized. The custard didn't set completely on the tomato-basil pie. They were all edible, but none were particularly memorable or repeatable. But I stuck with it, and I finally got it right. I am quite pleased with myself right now. Everything came together beautifully in this Spinach, Leek and Gruyere Tart. The pie crust was tender and flaky with just the right amount of crunch. The custard was smooth and creamy without being too rich. The spinach and leeks complemented each other perfectly. 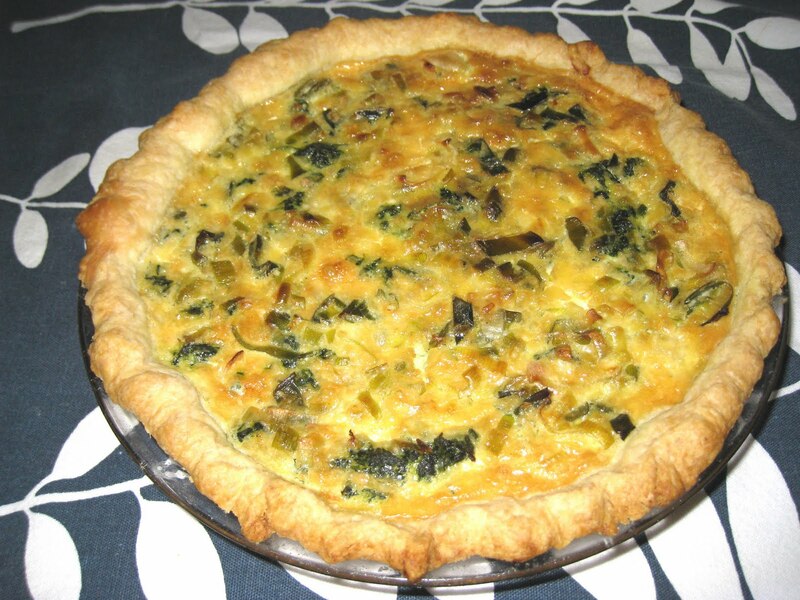 I based it on my quiche recipe, but I am especially pleased that I reduced the amount of cream, milk and eggs by 25 percent. With a dish this rich, that's no small thing. 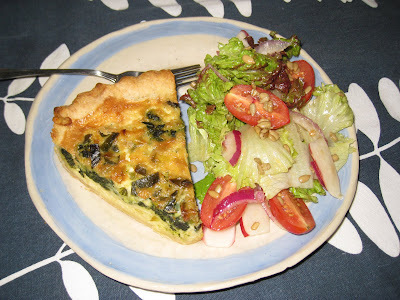 I know it's a big fat cliche, but throw a fresh garden salad on the plate along with a slice of this tart and you have the perfect lunch or dinner. Cut the butter into 1/2-inch pieces and place in the freezer for 15 minutes. Place flour, sugar, and salt in food processor and pulse two or three times to mix everything together. Add butter and pulse in 5 to 10-second intervals until a coarse mixture is formed. Add about two tablespoons of the ice water and pulse in 10-second intervals two or three times. Check the dough to see if it comes together when it is squeezed between your fingers. If necessary, add more water, a tablespoon at a time and pulsing once for about 5 seconds, until the dough comes together. You want to be a little careful here not to over-work the dough or you will have a tough crust. Place the dough onto a lightly floured surface and knead just enough to bring it together into a disk. Wrap the disk in plastic wrap and refrigerate for at least an hour (up to 2 days). Trim any tough stems off of the spinach leaves and rinse them. Heat a large pot over medium heat for about 2 minutes. Place the spinach in the pot and then cover the pot. Lower the heat as low as it will go and cook for 10 minutes. Remove from the pot and rinse with cold water to cool it. Using your hands, squeeze as much liquid out of thespinach as you can, and then cut it into a rough chop. Make sure the leeks have been thoroughly cleaned. Cut away any of the tougher green tips, then slice the leeks thinly. Heat the oil in a heavy skillet over a medium flame. Add the leeks and saute about 2 minutes. Add salt and pepper to taste. Cook leeks until they are translucent and limp, about 10 minutes. Let cool. Take the dough out of the refrigerator and let it sit for about 10 minutes so it wll be easier to roll out. Place on a lightly floured surface and roll out into a circle that is about an inch wider than the diameter of a 9-inch pie pan. Carefully layer the dough into the pan, gently molding it to the shape of the pan (do not stretch the dough). Fold the edges under and make a decorative pattern by pinching the edges between your fingers, or push down around the edge with the tines of a fork. Layer the cheese along the bottom of the pan, right on top of the dough. Then arrange the spinach and leeks evenly over the cheese. In a medium-sized mixing bowl, beat the eggs lightly. Add the flour and the dried mustard to the milk and cream mixture while it is still in the measuring cup and whisk it together. Add it to the eggs along with the Worcestershire sauce, salt and pepper and mix well. Pour it over the cheese, spinach and leeks. Bake at 350 deg. F. for about 50 minutes, until a sharp knife inserted into the custard comes out clean.